The Vancouver Orphan Kitten Rescue Association (VOKRA) called to let us know that there was a late-season litter of five in need of a foster home. Their mother was a launch-at-your-face feral and the volunteers were concerned that she would teach the kittens to hate humans. 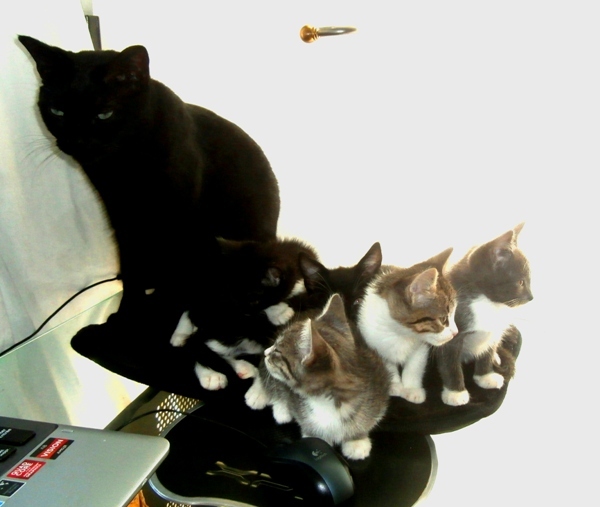 The feline mom was trying her best but the lessons didn’t take. 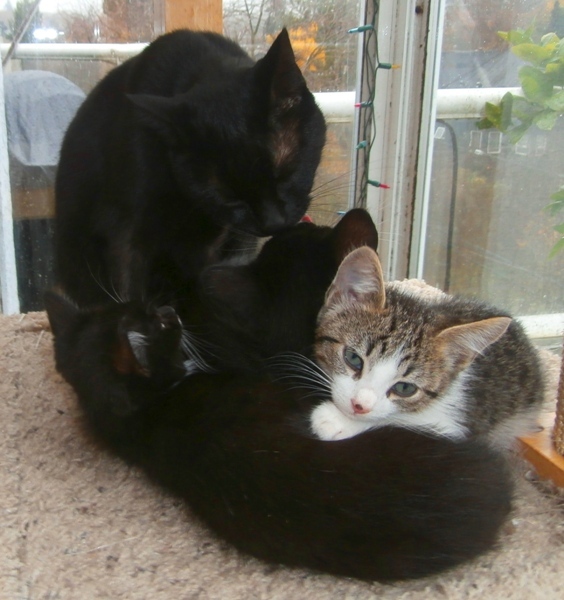 The five kittens loved people right from the start, and they got along well with our resident cats as well. This group was among the easiest batch we’d ever fostered. There were no behavioural or health issues and they had socialized themselves. The only difficulty was a highly complex feeding routine when they first arrived. 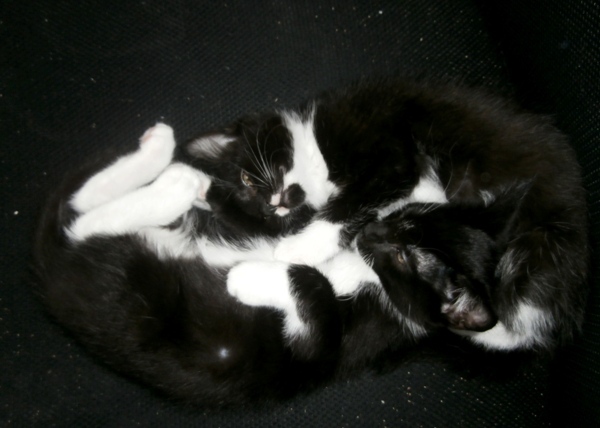 Some kittens experience digestive problems after weaning and these guys needed probiotics and a special mix of foods until their stomachs settled. Serenity, a little tabby, was the first of the kittens to approach us regularly. She loved lap-sitting so much that she’d actually climb our pant legs if we didn’t pick her up (though she was careful not to scratch us while doing so, using just the very tips of her claws to hold onto the fabric). She was so laid back that when she was placed in a carrier to go to her new home (usually a traumatic event for kittens), she just settled down on the little blanket inside, purring contentedly. 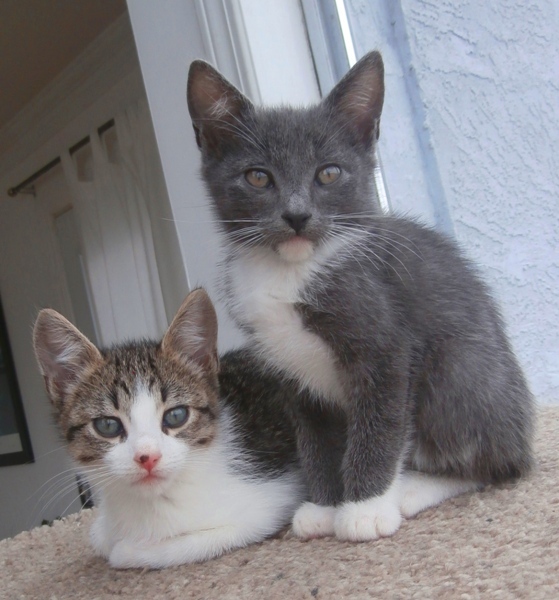 The next to be adopted was Quest, a slender gray kitten with a white beard that gave him the look of a small feline wizard. Quest was very bright and a bit more serious and thoughtful than the others, but equally playful and affectionate. He was very skinny and no matter how much he ate (and he ate a lot), he maintained his slim, leggy, Siamese-style build. 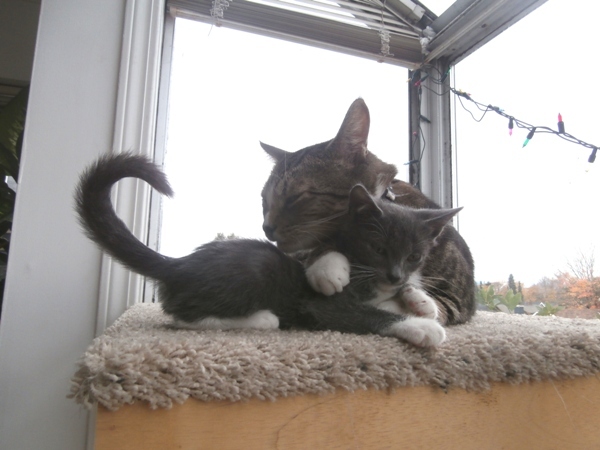 Quest was adopted as a companion for a resident cat who had recently lost a feline friend. Sherpa was a white and gray tabby with remarkable eyes: enormous, blue-green, and encircled by Cleopatra eyeliner (his eye colour will change over time; only certain oriental breeds such as the Siamese and some white cats maintain blue eyes into adulthood, and in white cats, this is associated with deafness). Sherpa was a snuggly, calm, easy going kitten who obediently posed for his profile pictures (which is unusual—taking profile pictures of kittens is typically like trying to photograph lightning). Sherpa found a loving home with a couple soon after Quest was adopted. Unsurprisingly, we were left with Coda and Cayoosh, the two tuxedo kittens (this was unsurprising, because black cats and kittens always take longer to be adopted and have the lowest adoption rates in general, despite research suggesting that black cats tend to have the best personalities. 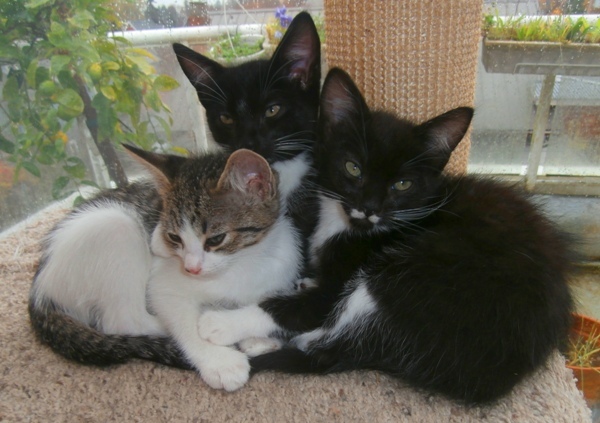 I wondered if we would have them over Christmas, but it was late autumn and there weren’t as many kittens available, so a lucky family soon spotted them on the website and fell in love. Coda was among the sweetest kittens we’ve ever fostered. Gentle, goodnatured, and calm, she was unfazed by the things that scare most cats and loved to be cuddled. When she first arrived, she wasn’t as pushy as the others about getting on our laps, but would sit nearby, waiting. I don’t think she realized that she was allowed to just hop up on us while we were at our computers. She soon figured it out though and became the ultimate lap cat. Coda had a funny little mustache, short rounded ears, and a face that was babyish even for a kitten; she’ll probably look like a kitten for her entire life. Cayoosh was a sleek, leggy, high-energy kitten, always on the go. 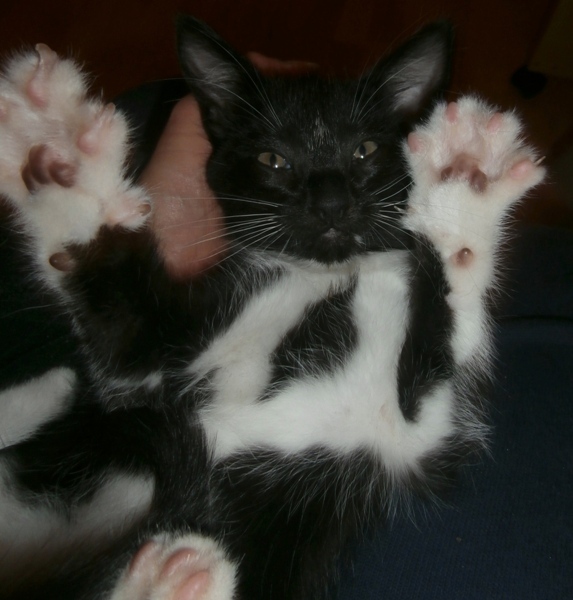 He loved to be held (particularly upside down on his back, showing off the cool black diamond marking on his chest), but wouldn’t stay put unless he’d thoroughly tired himself out beforehand. As the most confident male in the litter, he was also the self-appointed defender of his siblings. When a friend brought her large (but gentle) Bernese Mountain Dog to meet the kittens, Cayoosh was the first to step forward, hissing and puffing to let Stella know that he was ready to put up a good fight. I was impressed with the dog’s social skills. Stella quickly realized that all of the furry inhabitants of our home found her terrifying, so she lay on the floor, chin on the hardwood, making herself as flat, quiet, and still as possible, and let the cats approach her (if only every cat could have such a great dog for their first cross-species encounter!). The kittens and our resident cats circled Stella, approaching closer and closer with each pass, until finally they were sniffing and exploring the giant dog. Stella remained impressively calm, only letting out an excited “oorooroor” sound once while the cats were orbiting her. We were all very proud of her. One of Coda and Cayoosh’s new owners is a professional photographer, so we’ve been sent lovely pictures of the pair with the promise of more to come, providing a rare opportunity to watch them grow up over time. It’s always fascinating to see how they turn out as adults. In some cases, we’ve visited new owners after some time has passed and had the opportunity to meet the adult versions of our little fosters, but never before have we had a time-lapse view of their growth and development.